It is important to invest in right stock at a right time in order to become wealthy from stock market investment. However it is very difficult to identify Multibagger stocks (Raees Stocks) that can make you wealthy. In order to help you here is 10 Mutlibagger stocks that gave magnificent returns in the past. These multibagger stocks are likely to give good returns in the future also. The reference of all these multibagger stocks are taken from CNBC Awaaz program called as RAESS Shares. 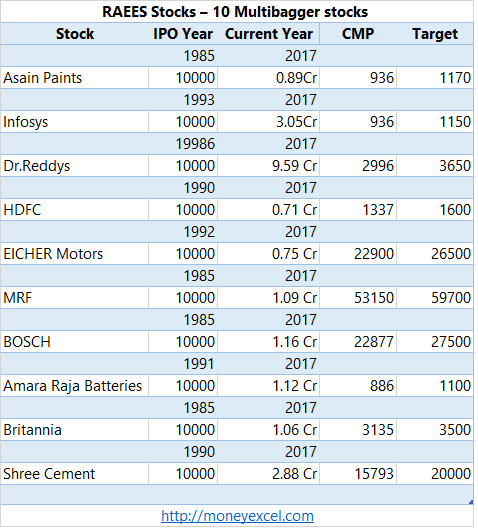 These stocks have notched up hefty multibagger gains from IPO date till today. Let’s take a look at these multibagger stocks. Asain Paints is first multibagger stock. Asain Paints is in business of manufacturing and selling of paints and coatings. Upcoming Housing for all and Infrastructure projects will surely give benefits to this stock. If you could have purchased Asain Paints stock of Rs.10000 during IPO time in 1985, you would have 0.89 Cr in your kitty. Asain paints is recommended for investment with target price of Rs.1170. Infosys is second Multibagger stock in line. Infosys is well known IT company in India. Infosys deals in software, cloud and infra services. If you could have invested Rs.10000 in Infosys stock during IPO time 1993, your portfolio value would be 3.05 Cr as on today. This stocks is recommended for investment with target price of Rs.1150. Dr.Reddys is pharmaceutical stock. Dr.Reddy’s has rich portfolio of multiple pharma products. Dr. Reddy is consistent performer stock. Dr.Reddy has generated magnificent returns for the investor. The investment of Rs.10000 made in Dr.Reddy’s in the year of 1986 is grown to Rs.9.59 Cr as on today. Dr.Reddy’s is recommended stock for investment with target price of Rs.3650. HDFC is next multibagger stock for the investment. HDFC is housing finance company and leading player in home loan segment. HDFC has given consistent return to the investor. Upcoming Housing for all and Infrastructure projects will surely boost performance of this stock. HDFC is recommend stock for investment with target price of Rs.1600. A story of Eicher Motors is known to almost everyone. Eicher Motors is leading automotive player dealing in manufacturing and selling of auto products such as tractor, bullets etc. Eicher Motors stock has given multibagger returns to investor since IPO times. The investment of Rs.10000 made in Eicher Motors in the year of 1992 is grown to Rs.0.75 Cr as on today. A unique product portfolio, innovation and strong management with passion is positive factor about this stock. MRF is next multibagger stock for investment. MRF is one of the most expensive stock as on today. MRF deals in manufacturing of car tires. MRF stock will surely get benefit from the growth of automotive industry. The investment of Rs.10000 made in MRF in the year of 1985 is grown to Rs.1.09 Cr as on today. MRF is recommended stock for investment with target price of Rs.59700. Bosch is in diversified business dealing in multiple products. Bosch has generated very good returns to investors in the past. The investment of Rs.10000 made in Bosch in the year of 1985 is grown to Rs.1.16 Cr as on today. Bosh is expensive stock, however, it is recommended for investment by CNBC with a target price of Rs.27500. Amara Raja Batteries is Raees stock that has made investor wealthy. Amara Raja Batteries is dealing in manufacturing and selling of automotive batteries, electronics products, and power systems. Amara Raja Batteries has given very good return to the investor. You can invest in this stock with target price of Rs.1100 as per CNBC. Britannia evergreen stock dealing in multiple Indian food products. Historically Britannia brand has made a lot of progress. Britannia has a good market presence. The investment of Rs.10000 made in Britannia in the year of 1985 during IPO is grown to Rs.1.06 Cr as on today. This stock is worth for investment with a target price of Rs.3500. Shree Cements is last multibagger stock. Shree Cement is one of the leading cement manufacturers of India. Shree cement has given magnificent returns to the investor in the past. If you could have made an investment of Rs.10000 in IPO of Shree cement in 1990, you would have got 2.88 Cr in your kitty as on today. Shree Cement is recommended stock for investment with a target price of Rs.20000. In addition to above stocks three other stocks recommend for investments are D B Corp ltd, GHCL and MM Forgings. What is your call about this Raees Multibagger stocks? Do you think that these stocks will outperform in future? has it got all the ingredients to be mb. abc bearing not better option?